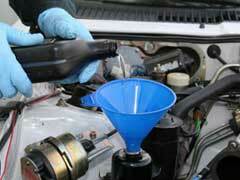 It is ideal you check your car’s power steering fluid level at least once a month. If you have had leaks in the past, you may want to do more than this. Typically, if you have a newer model vehicle your power steering reservoir will be opaque, so you can check the level this way. If you do notice it’s low, be sure to check components around it for leaks. If you do notice some then it’s time to do power steering repair. Repairs will range in difficulty depending on the problem. Say you encounter power steering pump noise, this happens when the pump has suffered damage. It is likely you will need a pump replacement, which can be tricky depending on your car’s pump placement and the extent of the damage. Meanwhile, a leak could come from a variety of places including the reservoir. If you notice power steering fluid on the ground, be sure to address this quickly, as you can run low fast, which will minimize your ability to steer your car. Along with addressing problems in a timely manner, regular maintenance is imperative in preserving your parts. As stated previously, the best way to do this is with regular inspections. These are quick, but can help you pinpoint problems before they become huge. Additionally, you might be tempted to go get services on your car like a power steering fluid flush. It’s important to note that while this may be good for some vehicles, be sure to consult your manual, as in some instances this service is unnecessary. Ultimately, by checking your power steering fluid level often and inspecting the components it can ensure your car’s steering remains in great condition. In turn, this will give you peace of mind when driving.